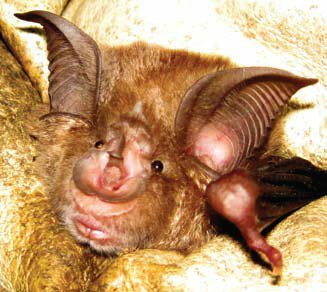 Twenty seven SSSIs are notified to protect the greater horseshoe bat - one of Britain's rarest animals, with a population of approximately 5,000. Conservation work at these sites focuses not only on the structures in which the bats roost and hibernate, but also on the habitat in which they forage. Because bats are nocturnal, estimating population numbers is extremely difficult. On a number of sites, however, where habitat improvement has occurred, recorded bat numbers have increased by as much as 50%. At Bryanston SSSI in Dorset, greater horseshoe bats have been studied for more than 50 years. The site covers just over a quarter of a hectare, with the bats roosting in the remaining section of a disused country house. The greater part of the SSSI is owned and managed by The Vincent Wildlife Trust, which has done a great deal of work to improve the roosting and hibernation opportunities for the bats. Conservation measures at 27 SSSIs are helping to increase the population of greater horseshoe bats. Colin Morris, The Vincent Wildlife Trust's Reserve Manager said, "Conservation work at Bryanston has been very successful, with a 100 per cent increase in the number of adults in residence (103 to 206) and an increase of 87 per cent to the number of juveniles born (55 to 103) in the past ten years. Having SSSI status is important to protect this vital roosting and hibernation site, and may help our case in the future to protect nearby grazing pasture from the impacts of development."